Higuera Hardwoods LLC was formed to offer you a wide choice of only the finest Flooring, Mouldings and Stair parts products from around the world in 2001. Higuera Hardwoods carries a full line of the finest Grade-A Bamboo flooring, Bamboo mouldings, Bamboo stair parts, Bamboo Plywood's and Veneers are available. The construction and finish of our bamboo products we feel is far superior to others on the market in its construction and finish, please let us prove it by offering a FREE SAMPLES to you. Higuera Hardwoods stocks an unusually large inventory, as we always strive to avoid having our customers wait for any products, we do offer and encourage custom products though if needed. We are also proud to announce a new full service manufacturing plant we have opened in late 2006 which will specialize in custom and standard floor mouldings, handrails, and stair systems. Higuera Mouldings will only produce and stock grade-A accessories. We are dedicated to only the highest quality mouldings to compliment our quality line of bamboo flooring. Bamboo flooring is becoming highly appreciated by customers because of its understated elegance, special appearance and unique coloring. Altering the layout designs also brings surprising results; these traits can't be found in other flooring woods. We exclusively use Moso bamboo, a type of fast growing grass plant, as our main raw material. Additionally, we have ensured the removal of all toxic chemicals from our manufacturing processes. Adopting high quality European glue, all emissions meet the E1 standard and are not harmful to the human body. 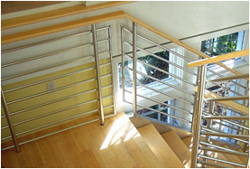 We also use the most abrasion-resistant aluminum-oxide finish, which surpasses the American ASTM4060 standard. We are dedicated to providing only the highest quality products for our customers and we only import directly from the manufacturers in the countries of origin. By operating this way it allows us to offer the most competitive prices available, and our regular on-site visit to all of our suppliers assures us that we are always offering the highest quality to our clients. We have invested a great deal of time and money in ensuring that we are using only the finest manufactures, we do not go shopping for products like many importers do we only sell from the best. Each item is thoroughly inspected prior to shipping or selling as to ensure the highest standards are always present at Higuera Hardwoods. We guarantee the quality of our products and we strive for excellent customer service at all times. At Higuera Hardwoods we pride ourselves on the customer service that we offer, as well as the atmosphere which has been provided for our clients in our showrooms and warehouses.Customer satisfaction is our priority. Higuera Hardwoods also pleased to offer wholesale and contractor accounts to qualified businesses.